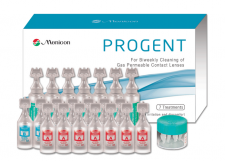 PROGENT cleans lenses and loosens and removes surface protein deposits after a short soak without manual rubbing. 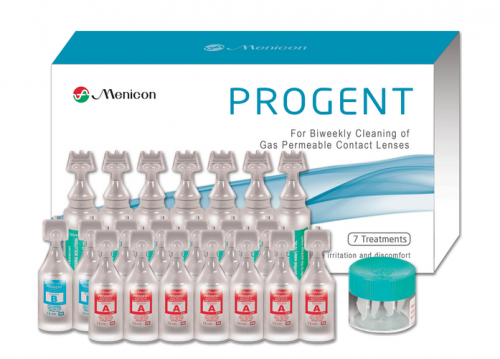 To ensure comfort, eye health and to prolong the life of gas permeable lenses, it is recommended that patients remove proteins with Menicon PROGENT bi-weekly. Previously approved for office use only, this solution is now approved and available for patient home use as directed by an eye care professional. Menicon PROGENT is a highly effective deposit and protein remover, a cleaner compatible with all RGP contact lenses. Simply soaking the lenses for 30 minutes will ensure the removal of deposits as well as the organisms most likely to contaminate lenses, including bacteria, fungus, molds and yeasts. PROGENT provides deep cleaning for gas permeable lenses without the mechanical rubbing or abrasives used in conventional cleaning or polishing. In fact, it is ideal for the growing number of gas permeable lenses that have surface coatings for comfort that should not be mechanically cleaned or rubbed.